This is a wonderful example of the artist’s work in a most rare cool palette. 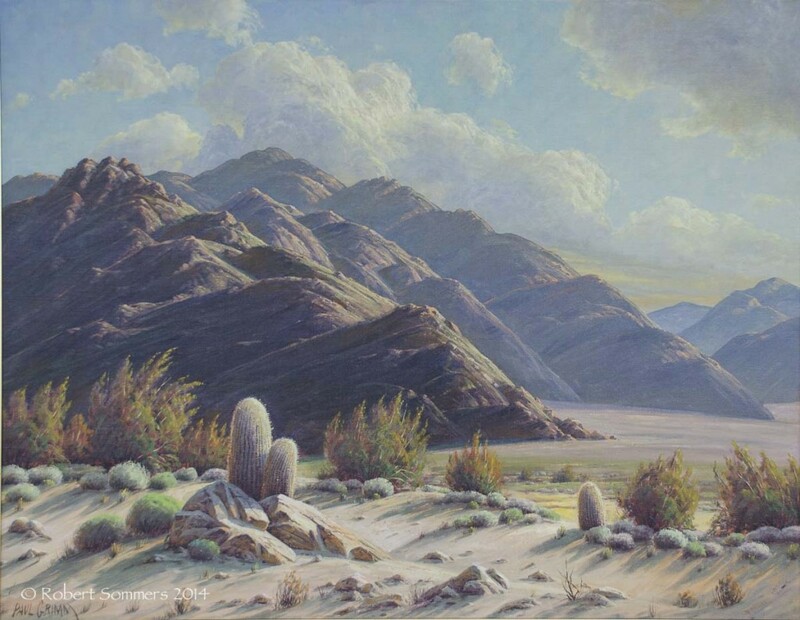 Paul Grimm – Desert and Mountain Symphony, 1958 o/c 36 x 46. signed l/l, titled verso. This is a very large and famous painting by Paul Grimm that hung in the Palm Springs branch of the Bank of America for many years until it was retrieved by the original owner and Paul Grimm. p.o.r. 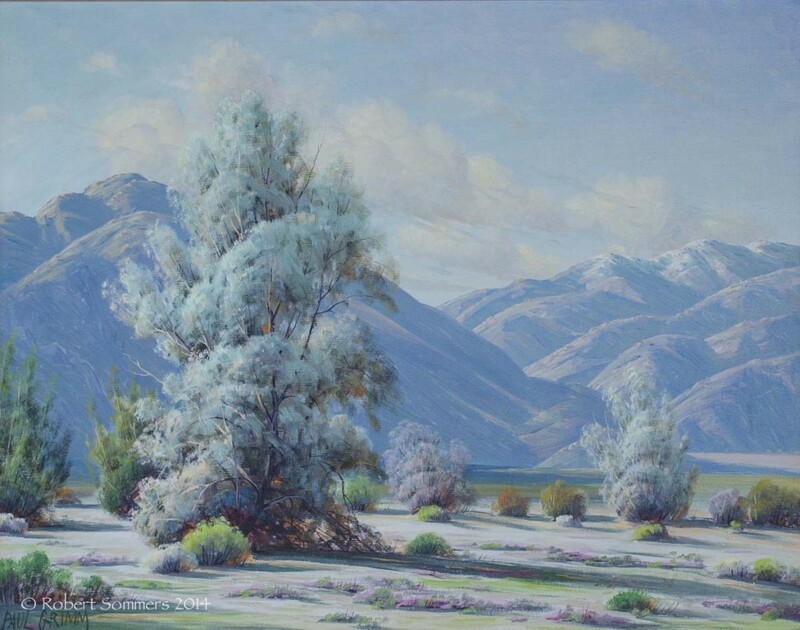 Born in South Africa, Paul Grimm was a desert and mountain landscape painter whose Palm Springs, California gallery attracted many prominent persons who became collectors of his work. He came to the United States at the age of seven. When he was eighteen, he won a scholarship in Rochester New York to study at the Dusseldorf Royal Academy in Germany. 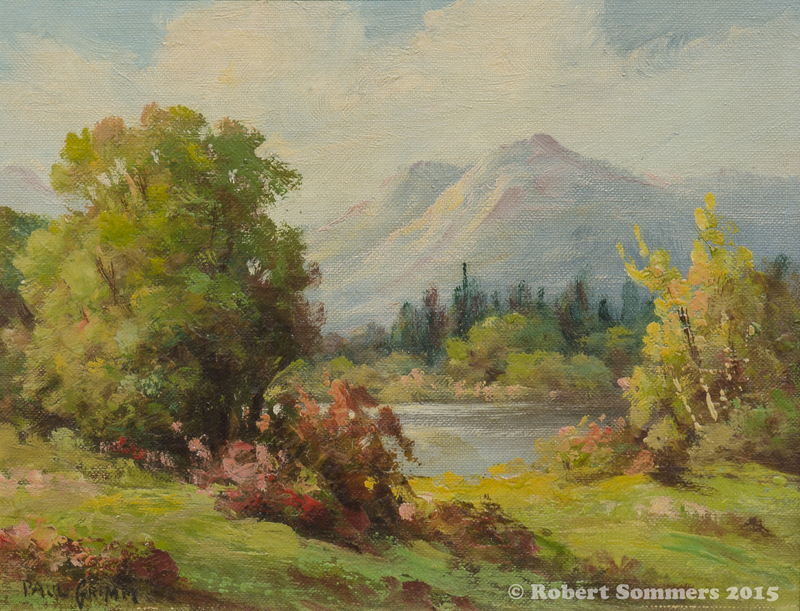 In 1919, he moved to Hollywood, California where he painted backdrops for movie studios, and in 1932, he settled in Palm Springs and maintained a small studio gallery there. A good friend who often stopped by was President Dwight D. Eisenhower. Grimm spent much of his summer time painting in the High Sierras, but he is known for his scenes of the changing moods of the Southern California desert. He also painted missions and Indian portraits.